examining the contribution of cooperatives to work and employment in informal employment and in the new forms of work. The present report proposes a pragmatic method by using cooperative typology as a proxy, highlighting information on different forms of cooperative employment. The key element of the method consists in reclassifying currently used types of cooperatives according to meta-types which represent different forms of cooperative employment, namely employees, worker-members and producer-members. We propose six meta-types, namely, “user cooperative”, “producer cooperative”, “worker cooperative”, “multi-stakeholder cooperative”, “secondary cooperative” and “enterprise cooperative”, according to the members’ function in relation to their cooperative. However, apart from some technical problems that could be solved by obtaining more qualitative information on currently used typologies, a number of conceptual issues should be discussed further, such as the distinction between producer cooperatives and worker cooperatives, statistical definitions for worker ownership and boundary issues concerning employment in subsidiaries and enterprise-members in enterprise cooperatives. 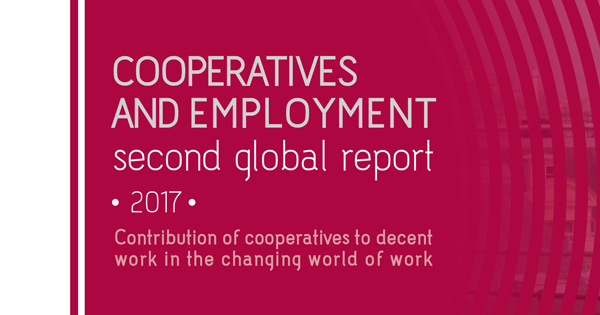 By using the proposed method and considering the issues being raised, the report presents updated quantitative information on cooperative employment, as well as on the number of cooperatives and types of members. Based on data from 156 countries, the updated estimate shows that employment in or within the scope of cooperatives concerns at least 279.4 million people across the globe, in other words 9.46% of the world’s employed population. Out of this figure, 27.2 million work in cooperatives, including around 16 million cooperative employees and 11.1 million worker-members. People working in the informal economy who join savings and credit cooperatives, mutual insurance cooperatives, multi-purpose cooperatives and consumer cooperatives have access to certain formal or semi-formal services and are connected to the formal arrangements they need in their life and in their work. In particular, these cooperatives can provide them with easier access to credit, education and training, affordable goods and services to meet their basic needs and a certain level of social protection based on solidarity and mutual help. Self-employed producers/entrepreneurs who join shared service cooperatives based on a horizontal integration strategy gain access to various services supporting members’ economic activities, which help them to attain economies of scale and a higher bargaining power. Worker cooperatives, which aim at providing decent jobs to their worker-members, can be a direct solution to the formalization of informal employment. However, to fully display their potential contributions, a favourable environment and an appropriate legal framework are necessary.